At big moments in the life of our nation we need good quality, trustworthy and relevant evidence and good use of that evidence to help us make decisions. Without it we hear the selective voice of vested interests. We see the headline that emphasises the extreme or the unlikely. We are subjected to the rhetoric of a yarn designed to lure us into a fictional world. And we are denied the opportunity to set these influences in context. In recent weeks, since the referendum result, some have spoken about the death of evidence following examples of bad use of numbers, misrepresentation of statistics and a disdain for knowledge. Of course decisions are made on the basis of emotions and beliefs as well as science. Those who work in the world of evidence gathering need some humility in what we claim. But evidence does matter. Anyone who cares about our country and wants us to succeed as individuals, families and communities should stand up and make the case. Unless we know what is going on now, unless we analyse what works, unless we focus attention on what matters, we are unlikely to make the most of the opportunity we must now seize in the months and years ahead. My current post was created by Winston Churchill in 1941 when he observed that the "utmost confusion is caused when people argue on different numbers". He called for someone to provide information that could be "accepted and used without question". That remains a powerful rallying call for me, for colleagues in the Office for National Statistics (ONS) and across the Government Statistical Service. There are some good signs. 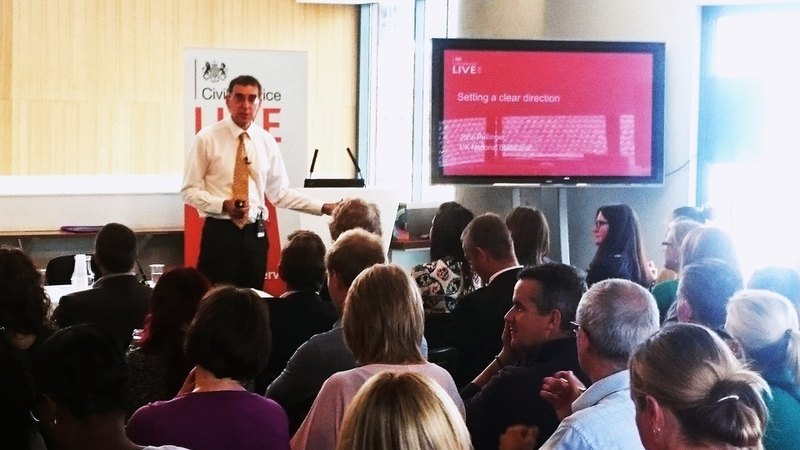 I found the recent Civil Service Live events really inspiring. With Michael Whitehouse of the NAO, I led a plenary session at the Cardiff event on improving policy outcomes. Our proposition was that better skills in use of evidence plus better mobilisation of the power of data are already transforming public services. There are possibilities over the next few years to go radically further. What we said was well received and is echoed in a variety of current activities. The Policy Profession has recently adopted a new curriculum for learning that stresses analytical skills. The systematic use of analytics is taking hold in many operational areas from tax gathering to health and safety, from the NHS to our schools. The Data Science Campus announced in this year's Budget and due to open in September at ONS HQ in Newport is being inundated with UK and international interest in how it could help us in understanding the dynamics of our modern economy, how our cities work and other pressing issues. The cross departmental analytical teams that have been assembled to support cross cutting policy issues from migration to trade are bringing new insights to the decision-making table. The Government Data Programme being led by the Government Digital Service is making a reality of the idea that data is part of our critical national infrastructure. All these initiatives and many more demonstrate that the civil service is seizing the opportunity. At the same time, there is a renewed commitment to the importance of presenting evidence effectively so that it can be understood, accepted and used without question, cutting through the clamour of noisy debate. There is a renewed commitment to the necessity to reflect in our own teams the diversity of experience of people across the country in order to help generate evidence that is relevant to the things they care about. And there is also a renewed commitment to the imperative to stand up and call out bad use of numbers as corrosive of democracy. Good use of evidence can help us develop an economy that will thrive outside the EU and deliver jobs and prosperity. Good use of evidence can help us fight for justice and enable the powerless to hold the powerful to account. Good use of evidence can help us create an environment we want to live in and a sustainable future for our children. Let's work together, step forward and help make it happen. I am relieved to see the Civil Service making such a point about making decisions based on evidence, the world needs people to be presented with hard facts to make logical, well-reasoned decisions, rather than more spin and misrepresentation of facts. However this statement concerns me - 'Good use of evidence can help us fight for justice and enable the powerless to hold the powerful to account.' I am afraid that with the recently published external media articles on the Government's complete and utter lack of impact assessments and proper research on the effects of the policies it has implemented on vulnerable groups in our society (particularly those of the DWP which were created to operate within Budget / Autumn statements given by the Chancellor) that our current Government is not operating on the basis of evidence-based policy which severely impacts people's ability to trust decisions made in future. Let us hope this is addressed going forward. Very encouraging however as an Information professional I would also like to see an active push on information (knowledge and data) literacy - developing the skills, knowledge, expertise and experts to enable information, knowledge and data to be properly codified, indexed and found. By this I don't mean just creating a database with a search engine for authors to store items with minimal metadata but having the content properly catalogued with useful metadata as an active and important part of the evidence process. Too often evidence and related documents are not properly filed or indexed and therefore lost. I would also like to see libraries (public, corporate, business, university, Schools etc..) as a prime source of information, knowledge, data and be extension evidence and the Library and information professional as the experts that enable discovery, collation, retention and use of this valuable commodity. On behalf of the Chartered Institute for Library & Information Professionals (www.cilip.org.uk), I would like to support the call-to-arms set out in this blog post. The UK needs to invest in evidence, information and knowledge management now to ensure that our industries remain globally competitive in the future as well as secure truly accountable government and citizen-focused public services. Making the most of our intellectual capital means investing in 3 key areas. Firstly, we need to encourage leaders in business and Government to develop their own information skills to ensure that they are able to deliver effective strategies for the Information Economy. Secondly, we need to promote information literacy at all ages so that every citizen is equipped to live successfully in an information-rich society. Finally, we need to ensure that our communities and businesses have access to trained and qualified information professionals to help them develop future-proof information resources. We have the knowledge and expertise to be a world leader in today’s complex and competitive world – it is time to embed this thinking across the public and private sector to ensure that we make the most of this opportunity. I agree with Nick. We not only need good quality evidence but also have the capabilities to interrogate it in a such way that we get the most from it. People need to be able to make appropriate judgements about any sort of information and understand that no information is neutral but has been produced for a purpose and all authors, not matter how authoritative, have an agenda that needs to be scrutinised. These are the basic building blocks of information literacy and something that all information professionals not only understand but can teach others. Primary sources need to be catalogued and made available. "Mash ups" need to be avoided, if at all possible.